Haiku by Taneda Santoka. Artwork by myself. One of the Buddist monks' decepline is to visit house to house to gather what food each household can offer. What comes from the sky, like rain, snow, and hailstone, fall equally to everyone, even to Santoka's bowl, too. To visualize this idea, I placed white circles of equal size, equally spaced. According to weather forecast, we expect substantial snow fall today and tomorrow. Possibly hailstones, too. 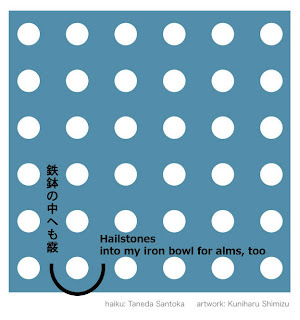 This has been a favourite haiku from Santoka for some time. I love the contemporary feel of the artwork coupled with Santoka's immediate and inclusive poetry.